Prineville will be able to call itself Rip City for a day. The Portland Trail Blazers and Moda will bring the Sixth Annual Rip City Rally to Prineville on Wednesday, Sept. 12. A team of Trail Blazers ambassadors and staff will embark on a week-long journey from Sept. 10 to 14 around the state of Oregon, engaging with Trail Blazers NBA basketball fans all along the way. This event brings Oregon communities together to showcase the Trail Blazers as "Oregon's Team." "The Rip City Rally is a great opportunity to bring the excitement and energy of the Trail Blazers all over Oregon, reminding fans that we're not just Portland's team – we're Oregon's team," said Chris McGowan, president and CEO of the Trail Blazers and Rose Quarter. "It's a great way to show our appreciation and connect with fans in their local communities to get excited about the upcoming Trail Blazers season. We're proud to have our partner Moda with us to continue to build healthier communities across Oregon." Trail Blazers personalities and Moda health company representatives will also activate the communities in Klamath Falls (Sept. 10), Bend (Sept. 11), Madras (Sept. 13) and Hood River (Sept. 14). Trail Blazers broadcasters Lamar Hurd, Kevin Calabro and Brooke Olzendam along with Trail Blazers In-Arena Host Todd Bosma will be there. Trail Blazers mascot Blaze the Trail Cat and members of the BlazerDancers will rally the crowds. An entire day of events is scheduled in each city along the route. As part of the Trail Blazers' and Moda's partnership to showcase healthy and active living, events will focus on providing activities for kids, including school assemblies, Youth Basketball P.E. Takeovers and on-court Youth Basketball Activations at the Rip City Rally. In Prineville, the Rip City Rally will include one school assembly, two P.E. Takeovers, and a career panel with high school students, which are not open to the public. The Trail Blazers reps will talk to students in Kelli Johnson's CCHS leadership class about the various careers they offer and how to obtain those jobs, focusing on how college education can lead to careers in the sports and communication industry. "Because of our emphasis on college and career readiness, this is a great opportunity for our students to be exposed to careers they may not usually be exposed to in our rural community," Johnson said. "This also allows students to make connections with people in career paths they may choose to take." Prineville Mayor Betty Roppe will join Trail Blazers and Moda representatives to tip off the Rip City Rally with a ceremonial flag raising and opening ceremonies at 4 p.m. Sept. 12 on Elm Street between Second and Third streets next to Pioneer Park. Fans are invited to this free community fair from 4 to 6 p.m., featuring activities for the whole family, including the opportunity to interact and play basketball with Trail Blazers personalities, take photos with the 1977 NBA Championship trophy, and win game tickets and other prizes. Supporting partners of this year's rally include Country Financial, Energy Trust of Oregon, Pacific Power and Windermere Real Estate. Energy Trust will give away free limited-edition Trail Blazers shirts as part of a free home energy review at the rally. 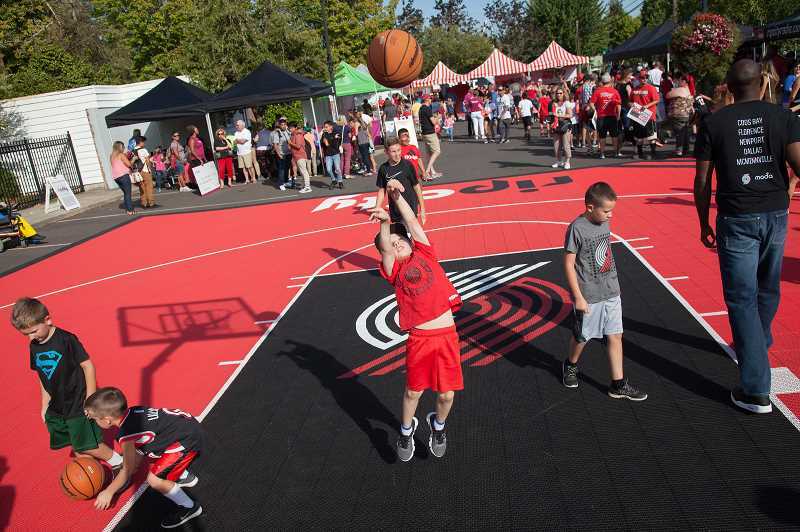 Windermere Real Estate agents will hold a drawing for an autographed Trail Blazers basketball, hand out Trail Blazers keychains, and host a coloring station for kids at the Windermere tent. Trailblazers.com/rally will provide updates and information all along the rally, and fans can follow the rally's progress by using the hashtag #RipCityRally. "Our partnership with the Trail Blazers has always been all about building healthier communities," said Dr. William Johnson, president of Moda Health. "The Rip City Rally is an exciting opportunity for us to engage with people across Oregon and to listen to their stories. The goal is that in the end we can be better together."